As this newsletter was on the verge of going to press, we received some exciting information at the Gala on May 7.....a complete report will follow in a future issue, but this is too good to wait! Gala 2000 was a rousing success, especially because of some incredible news delivered by Chancellor Marye Anne Fox! The entire audience of several hundred guests enthusiastically rose to their feet upon hearing Chancellor Fox announce a commitment of $1.2 million to the JC Raulston Arboretum Education Center. This very special gift was made by Ms. Ruby Vann Crumpler McSwain, better known as Ms. Ruby to her friends. It is particularly significant because it puts us within striking distance of starting construction of Phase I: the Education Center and Entrance Pavilion/Zone 8 Greenhouse. In fact, we are actually within $122,000 of advertising for Phase I construction bids as I write this letter. Chancellor Fox went on to say that she will pursue the avenues necessary with the NC State University Board of Trustees to name the Education Center for Ms. Ruby......exciting news, indeed! In addition to this great news from Ms. Ruby, the audience was also informed that Mr. Willie York had an important announcement for the already delighted crowd. Mr. York has decided to change last year's $300,000 campaign challenge to a pledge to be paid immediately upon commencement of Phase I construction of the Education Center, so as to "put us over the top!" The support Mr. York and his late wife Mrs. Elizabeth W. York have shown the JC Raulston Arboretum over its history has been legendary and we are extremely grateful. In addition to the $122,000 still needed for Phase I, we also have two additional and equally important phases of this large project still in need of financial support: the Staff/Volunteer Building and the Superintendent Office/Shop. We will continue to raise funds for them even after Phase I construction has begun and, with your help, we can wrap up their fates rapidly! So my final message is a simple one........help us complete our funding goals for all phases of construction, we are so close! Please contact Ms. Chris Wessel or Mr. Keith Oakley at (919) 515-2000 for assistance in making a contribution or inquiring about existing opportunities to complete the project. I left last time with a promise to elaborate on a few more items, specifically related to people. I only briefly mentioned one of our newest staffers, Nancy Doubrava, who, as our new Interpretive Specialist, has assumed responsibility for facilitating the concept of "who we are and what we do" for our visitors. This is a new position for the JCRA and Nancy has hit the ground running, taking on the mammoth, long-term, and ever so critical task of plant labeling with the help of our new computer engraver. She has assembled an able group of volunteers to assist her as she develops a consistent system of labeling for use throughout our grounds. The Finley Rose Garden will be the first to benefit from these efforts, and should be "equipped" at the time of this reading. It is important to mention that Pi Alpha Xi (PAX), the departmental honor society of floriculture and ornamental horticulture, has been pivotal from the start for help in labeling the JCRA. We owe our thanks for their long-term support! Nancy has also recently completed a new "Welcome Sheet," a cleverly adaptable introduction to the JCRA which can be customized for any visiting group. Although Nancy came to us from South Carolina, she has roots at NC State and the JCRA from back in the late 1970's. On the Assistant Director front, the news is that we will continue our search until the right candidate is found. However, in the meantime, we are delighted to announce the hiring of Todd Lasseigne for a part-time JCRA Plant Collections Management Fellowship, a position which will bridge the time until the selection of a new Assistant Director. Todd is eminently qualified for this position while he finishes his Ph.D. under Drs. Frank Blazich and Stu Warren in our department. Todd has traveled extensively, has a superb grasp of plant diversity as unanimously judged by his peers, and has worked at the JCRA in the past. He, too, has ambitiously begun his new role by reviewing the Cercis (redbud) and Lagerstroemia (crape myrtle) collections, collaborating on Mangleitia propagation work, and assisting Nancy Doubrava with labeling protocol, writing plant descriptions, and plenty more. I'd like to mention a special thanks to Dr. Arthur Kelley, the person who constructed, launched, and maintained our first Web site. He is also a faculty member here at NCSU and his professional obligations have become pretty demanding, so Chris Glenn will take over from now on. Art was responsible for most things "Internet related" for us; among many innovations, he helped set up the Guides' Post section of the Web site so all of our tour guides could rapidly share pertinent information. He also linked-in the Lyons' Den, an easily accessed archive for all of my own e-mail updates.....and all the while, he's been digitizing the JC Raulston slide files, an enormous task. We are grateful for all of his contributions! On the "plant front," there's lots to catch up on. Perhaps the most dramatic development has been the removal of the Leyland cypress from around the Labyrinth in the West JCRA. They were finally done in following Raleigh's record 20" snowfall. Our decision to remove them was really not terribly radical when you consider they were directly in the "footprint" of our planned Education Center. A large collection of Buddleja (butterfly bushes) species and cultivars has replaced the Leylands within this ring-shaped bed, as have several annual vines which will use the remaining trunk "posts" as guides to the sky! Dr. Dennis Werner, of our department, is the generous mastermind of the Buddleja collection; he has also begun efforts in Cercis breeding nearby, and we are fortunate to benefit from his expertise. Our Annuals Area will see a few changes this summer, displaying the usual diverse assortment of "single season" landscape materials, as well as a new presentation of two botanically similar species: Helianthus annuus (sunflower) and Rudbeckia hirta (black-eyed Susan). We've tried to assemble as many cultivars as possible of both so as to allow for side-by-side comparisons of an already "hot" plant (the sunflowers) and an unfortunately under utilized one (the black-eyed Susans). The latter has perennial qualities, but is more frequently exploited for single season performance since it flowers readily the first year from seed. This should prove to be an intriguing display. We were also pleased to assist in a very special effort which will have lasting implications. Several months ago, I received a phone call from Dr. Roy Larson who mentioned that Dr. and Mrs. Fred Cochran were moving from their home of many years and that it might be possible to secure several of their magnificent cut-leaf Japanese maples before the move takes place. To make this a shorter story and one with a very happy conclusion, Mitzi Hole enlisted the help of Paul Lineberger, Brad Holland, Diane Cutler, and Anne Calta to dig and transplant these specimens. The most incredible one is in front of the brick house in the Southall Garden, with the others now residing in the Japanese Garden. For those of you unaware of Dr. Cochran, he was a member and Department Head of our department for many years, as well as the originator of an entire line of popular azaleas, including 'Wolfpack Red', one of the most striking. We are ready for the World Botanic Gardens 2000 Congress Pre-conference Tour group visit scheduled for June 24. These folks will be working their way to Asheville from Charlotte (the LONG way!) visiting a host of gardens during their journey. It's a marvelous opportunity to showcase the JCRA to an international audience and our staff and volunteers have prepared well for the occasion. We were highlighted in a major way by the NC State Alumni Magazine....a long, in-depth, and beautifully illustrated article to be sure. What, you're not an alum? Then, stop by the Volunteer Office and pick up a copy. In closing, on behalf the entire JCRA family, I'd like to extend my sincerest thanks to our neighbors, Miles Wright and the Eyebeam Corporation <www.eyebeam.com> for their seemingly unending stream of support. Not only do we lean on them constantly for the use of their meeting rooms, but we most recently received a gift in the form of $15,000 printing credit, renewable each year. We look forward to many years of a mutually beneficial friendship. Speaking of good friends, we've got many more. As we continue our renovation of the Perennial Border, our gratitude goes out to the incredible generosity of Plant Delights Nursery <www.plantdelights.com>, Niche Gardens <www.nichegdn.com>, Fairweather Gardens, Joy Creek Nursery <www.joycreek.com>, Yucca Do Nursery, and Singing Springs Nursery for their donations to this project..........much more to talk about, but until next time, visit us in person or in cyberspace! By Dennis J. Werner, Ph.D.
Why redbuds? Good question! With all of the plant improvement opportunities possible in the wide range of species present at the JC Raulston Arboretum (JCRA), why would I choose redbud as a candidate species for breeding? As a native of rural southern Pennsylvania, the redbud was a common resident of the woodlots I roamed as a youngster. With its graceful architecture and lovely flowers, I've always considered it one of my favorite native woody plants. Flowering of redbud was proof positive that spring was finally escaping the firm grip of another Pennsylvania winter. Familiar throughout most of my life only with the common light purple flowered wild form, it was not until I was introduced to the collection at the JCRA that I became aware of the diversity in the native redbud and related species. Having spent most of my professional career breeding peaches, a species with limited genetic diversity, the redbud offers numerous possibilities for improvement and the development of new ornamental types. The variation is remarkable, and thinking about the potential combinations of genetic traits is enough to raise the blood pressure of any plant breeder with a pulse! - red leaves, variegated leaves, glabrous shiny leaves, pubescent leaves, male and female sterile forms, weeping growth habit, double flowered forms, purple fruits, dwarf forms, pink flowers, white flowers, and red (o.k., almost red) flowers. Have I missed anything? Mike Dirr, please FAX me if I have! As many of you are aware, the late J.C. Raulston, although enamored with all members of the plant kingdom, was particularly fond of redbuds, and he acquired a remarkable collection of redbud taxa at the JCRA, perhaps the best in the world. The availability and breadth of this collection makes it possible for us to 'jump right in' and begin hybridization efforts. Thanks, J.C. In this article, I will briefly describe the history and characteristics of the major cultivars and forms available or present in Cercis canadensis and its botanical varieties, mexicana and texensis. I will also comment on some of the objectives of our breeding programs, and relate some of our observations, and observations of others, on the hybridization procedures and challenges in this group. For those interested in redbud, I strongly suggest the wonderful article written by Dr. Raulston in Arboretum Newsletter No. 14, July 1986 (available on the JCRA Web site). Some of my comments and descriptions are taken from J.C.'s writing and from conversations with him about the collection, which incidentally, is found in the rear corner part of the west Arboretum, near Beryl Road. Additional information was gleaned from Dirr's "Manual of Woody Landscape Plants," which provides an excellent overview of the genus Cercis. 'Alba' - Name given to perhaps any of the white flowered forms present in the industry. The cultivar 'Dwarf White' found in the Arboretum, demonstrates an attractive compact, spreading growth habit. 'Dwarf White' lacks anthocyanin pigment in all plant parts, including newly emerging leaves and immature stems, typically pigmented in redbud. This suggests the lack of flower pigmentation is due to a mutation in the anthocyanin biosynthesis pathway, causing a disruption in anthocyanin synthesis. 'Royal White' - A cultivar offered by Hidden Hollow Nursery in Belvidere, TN. Described as having somewhat larger flowers than the usual 'Alba'. This cultivar currently is not in the Arboretum collection. 'Forest Pansy' - An interesting purple leaf cultivar with deep purple flowers. Although this cultivar is often described as being new to the nursery industry, according to Hubert Conlon, an extension specialist at the University of Tennessee, it originally was discovered in 1947 as a chance seedling at the former Forest Nursery in McMinnville, TN (communicated by Mr. Conlon in a letter to the editor in the January-February 2000 issue of Fine Gardening magazine). Beautiful in bloom, and stunning as the intense purple foliage emerges in early spring. The intense purple color gradually fades as temperature increases during the growing season, such that in late June to early July the color has faded to a dull bronze in the Piedmont of North Carolina. Mr. Conlon also relates that 'Forest Pansy' is less cold hardy than other redbud cultivars. My observations of 'Forest Pansy' suggest that it is a shy producer of fruit, although this may simply be a function of the lack of adequate cross pollination on trees I have observed. A small specimen of 'Forest Pansy' is found at the Arboretum, as the older specimen was blown down by Hurricane Fran in 1996. For those interested in observing larger individuals of this beautiful cultivar, proceed to Biltmore Hall at the corner of Dan Allen Drive and Western Boulevard on the NCSU campus. Four beautiful 'Forest Pansy' trees are planted around the building; two specimens are nestled in the natural area immediately adjacent to the west end of the building facing Dan Allen Drive, behind and down the slope from the trees of Cercis canadensis var. texensis 'Texas White' planted along Dan Allen Drive. We have used 'Forest Pansy' in hybridizations with other cultivars, and find that it is a shy pollen producer, thus somewhat challenging to use as a male parent. In our studies, first generation progeny derived from hybridization of 'Forest Pansy' with green leaf cultivars yield green leaf offspring, but possessing greater amounts of red pigmentation in the stems and leaf petioles. We will grow these first generation plants to maturity, obtain second generation offspring from them, and attempt to recover red leaf progeny in this generation. 'Silver Cloud' - An interesting variegated leaf form with unusual "splotched" (sorry, couldn't think of a better term) leaves, at times almost appearing as if someone had flung green paint onto white leaves. The pattern and extent of variegation seems to be variable from year to year, probably influenced by environment and developmental stage of the tree and any particular leaf. Young leaves often appear to be completely white as they first emerge, acquiring patches of green chlorophyll as the leaf develops and ages. In his description of 'Silver Cloud' in the 1986 JCRA Newsletter article, Raulston characterized 'Silver Cloud' as producing few flowers, but the 13-year-old tree at the Arboretum flowers abundantly. 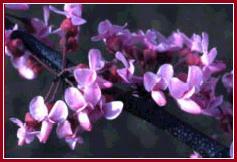 Flowers are a light purple, much less intensely pigmented than common redbud. According to Raulston, it was introduced in 1964 by the late Theodore Klein, Yellow-Dell Nursery, Crestwood, KY. The inheritance of the variegated character is unknown. In our hybridizations of 'Silver Cloud' with three other cultivars, using 'Silver Cloud' both as a male and a female parent, all first generation offspring demonstrate normal green foliage. Dirr, in his 'Manual of Woody Landscape Plants', refers to this cultivar as a chimera (a genetic mosaic), based on the observation of occasional branches producing only non-variegated leaves. By definition, if 'Silver Cloud' is a chimera as proposed, no sexually derived offspring of 'Silver Cloud' should show variegation. We have grown out offspring from seed collected off of 'Silver Cloud', and have demonstrated sexual transmission of the variegated condition, confirming that 'Silver Cloud' is not a chimera. 'Silver Cloud' is slower growing than standard redbud, and seems to show more extensive variegation when grown in partial shade. During periods of cool weather, the variegation is accompanied by the development of red pigment in newly emerged growth, providing a beautiful combination of colors. 'Flame' - The only redbud that looks like a double-flowered ornamental cherry when in full bloom. An interesting "double-flowered" cultivar in which the flowers contain about 20-25 petals, additional stamens, and typically a single ovary. Often described as a "new" cultivar, but actually discovered in the wild in 1905 in Illinois, and according to Dirr, named and introduced by Louis Geraldi Nursery, O'Fallon, IL in 1965. 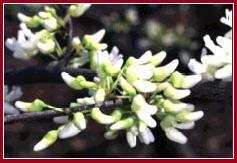 This cultivar was described in an article entitled "A double-flowered redbud (Cercis canadensis var. plena)" published in volume 23 of the Missouri Botanical Garden Bulletin in 1935. The extra production of petals in the flower has distorted the typical legume flower morphology, such that it is difficult to determine that this cultivar is a true legume based on flower structure. Generally flowering about a week later than other redbuds, this cultivar appears to be almost totally female sterile. I have not observed a pod on the mature tree at the Arboretum in the past three years. However, pollen production is abundant, and we have successfully used 'Flame' as a male parent in controlled crosses. This spring, on the tree at the Arboretum, we observed a small cluster of flowers that had reverted back to the single flowered morphology typical of the species. This is suggestive, but not definitive proof, that 'Flame' may be a genetic chimera. Fully describing the basis for chimerism and its consequences is beyond the scope of this report, except to state that although 'Flame' produces double flowers, it may only transmit the gene for single flower morphology when used in sexual hybridizations. Flower color is rose-pink. A beautiful tree in bloom. Flowers on 'Flame' appear to last longer than on single varieties, perhaps due to a lack of fertilization. 'Wither's Pink Charm' - A bright pink-flowered form found in the mountains of Virginia around 1930 by D. Withers. Like many of the atypical redbuds, it is difficult to find in commerce. A very attractive tree, I had the chance to see the tree at the Arboretum flower in 1998 and 1999 before it perished from canker disease in the summer of 1999. Fortunately, we have obtained a replacement tree, courtesy of the kind folks at Gilbert's Nursery in Chesnee, SC. Thanks, Charlotte! 'Appalachian Red' - A relatively new cultivar, 'Appalachian Red' is sometimes offered as 'Appalachia' in the trade. Although promoted as red flowered, the flowers are a deep pink, close to red, particularly when just emerging from the bud, but not a true red. Flowers later than most cultivars, typically at the same time as 'Flame'. 'Tennessee Pink' - Another pink flowered introduction, in my mind a truer pink than that shown on 'Wither's Pink Charm'. Discovered, introduced, and marketed by Harald Neubauer, Hidden Hollow Nursery, Belvidere, TN. A small tree, about 3 years old can be found in the Arboretum. It flowered profusely in the spring of 2000. 'Pauline Lily' - Another pink flowered plant being propagated and marketed by Harald Neubauer, this cultivar was discovered in the mountains of West Virginia, and named after the wife of the discoverer. Not yet included in the Arboretum collection, Mr. Neubauer tells me that this tree produces almost white flowers that have only a slight pink blush. Mr. Neubauer also states that 'Pauline Lily' flowers late, along with 'Appalachia' and 'Flame'. Mr. Neubauer will kindly be providing trees of 'Pauline Lily' for inclusion in the Arboretum collection this year. 'Bartlett King' - Not yet included in the Arboretum collection, and a cultivar I have not personally seen, an old specimen of this cultivar can be found growing at the Bartlett Arboretum near Charlotte, NC. Unique in that it produces normal appearing flowers, but the tree is female sterile, and produces no pods. As far as I can ascertain, not previously available in the trade, but now being propagated and marketed to a limited extent by Harald Neubauer. 'Covey' - One of the two interesting arching/weeping cultivars available in the trade. This cultivar, a true C. canadensis var. canadensis type, has stems that show an interesting contorted, zigzag growth pattern, adding to the unique architecture. Leaf size is normal, to perhaps slightly larger, than the species. The original plant has grown in the garden of Cornelia Covey of Westfield, NY since the mid-1960's, and has been propagated and patented by Tim Brotzman, Brotzman Nursery, Madison, OH (plant patent number 010328, awarded in 1998). A small tree exists in the JCRA, personally donated by Mr. Brotzman in 1998. This tree, now only 3 years old, flowers prolifically and already shows the typical weeping architecture. Flowers are a typical purple color. It is a prolific pollen producer, and sets abundant fruit. Crosses of 'Covey' with standard non-weeping redbuds gives rise to normal progeny in the first generation; however, plants appear a bit weaker and slower growing than normal, and show a tendency to exhibit the zigzag stem growth. 'Traveller' - Yes, that's how its spelled! The other weeping form available in the trade, this patented cultivar (plant patent 008640, issued 1994) is botanically a selection of C. canadensis var. texensis, found in the western to southern portion of the range, primarily Texas, Oklahoma, and Mexico. In my opinion, a more attractive cultivar than 'Covey' as the weeping growth and the glossy, leathery leaves typical of botanical variety texensis combine to produce a beautiful landscape tree. Two trees, about 5-6 years old, can be found at the JCRA. Both are in the east Arboretum; one, near "The Necessary," is a high grafted standard, and demonstrates very nicely the arching branch architecture. The other, in the Mixed Border near the arbor and the Paradise Garden, is low grafted, and has been left to develop with little "pruning shears" intervention by the JCRA staff. Consequently, this plant has developed into a form more characteristic of a groundcover rather than a small tree. Interestingly, 'Traveller' may represent a genetic dead-end from a breeding standpoint. Fruit set has never been observed on the JCRA trees, and in our experience, no functional pollen is produced. Flowers are typically purple. A testament to the fact that it "pays to keep your eyes open," 'Traveller' was discovered as a chance seedling in a row of trees by Dan Hosage, Jr. of Madrone Nursery, San Marcos, TX. 'Texas White' - A white-flowered cultivar of C. canadensis var. texensis. Like 'Traveller', 'Texas White' possesses attractive, glossy, leathery leaves and a more compact growth habit typical of variety texensis. White flowered, it blooms slightly later than typical C. canadensis var. canadensis. Found in the east part of the JCRA near the parking lot, two lovely specimens also can be found near the 'Forest Pansy' trees on Dan Allen Drive, next to Biltmore Hall on the NCSU campus. Botanical variety texensis appears to be sexually compatible with typical C. canadensis, as we have successfully hybridized 'Texas White' with 'Silver Cloud', with the long-term objective of developing variegated foliage forms with purple or white flower color possessing the compact growth, and glossy, leathery foliage typical of botanical variety texensis. Check with me in ten years! 'NC-3' - Not a named cultivar, but a selection of C. canadensis var. mexicana obtained by J.C. Raulston and growing in the west Arboretum. Not being familiar with the extent of variation in this botanical variety, I am uncertain if the tree in the Arboretum is typical. In my opinion, 'NC-3' is noteworthy for the very attractive purple pigmentation in its fruit that persists throughout the growing season. This selection also possesses pubescent stems and leaves, which appear to be transmitted to first generation progeny when used in crosses with normal non-pubescent C. canadensis. Probably not worthy of cultivar status, but a useful plant for breeding. 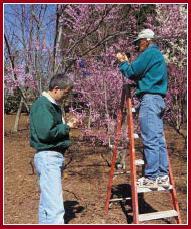 Dennis Werner and Layne Snelling (left and right) are busy as bumblebees pollinating redbuds. The potential for breeding new and novel forms of redbud is great due to the high number of interesting genetic variants present in the species and the related botanical varieties texensis and mexicana. Having attempted controlled hybridizations between specific cultivars for 3 years, I certainly agree with other breeders of this group that controlled hybridization is very difficult, fruit set "take" is quite low, often less than 5%, and success varies greatly from year to year based on unknown factors. In our three years of hybridization, we have had reasonable success in one year, and very low set in the other two. Evidence we have obtained in the 3 years of experience working with redbud, and insights obtained by other breeders, suggests that redbud may be self-incompatible, meaning that 2 different cultivars growing in reasonable proximity to each other are needed for fruit set, similar to the situation in many plants, such as apple. An isolated tree of a single cultivar would be predicted to set very few or no fruit. If true, instead of resorting to the laborious mechanics of hand hybridization and accepting the typical low success rate, it should be possible to grow trees in pots, place the two different potted cultivars one wishes to hybridize together in a screen cage to exclude foreign pollen, introduce some bumblebees (the primary pollinator) into the cage, sit back in a chair and sip lemonade, and allow the bumblebees to "do their thing" and make the crosses. Most bumblebees I know work from sunup to sundown, don't require breaks, work weekends and holidays, and rarely file workman's compensation! Because of self-incompatibility, all seed produced on each parent tree should be a hybrid between the two cultivars. We have established trees of numerous cultivars in 15 gallon pots, and will use them in hybridizations using the previously described method next year. These crosses represent the first steps in what we are confident will be a successful effort to develop new and novel forms of our lovely native redbud. Please be patient, and stay tuned. Acknowledgments. Thanks to Todd Lasseigne and Bob Lyons for their comments and suggestions, and to Layne Snelling for his assistance with the redbud breeding efforts. In the next few months, visitors to the Arboretum will be seeing many changes taking place within our plant collections. Some of these changes will be surprising and represent an exciting time for the JC Raulston Arboretum. Exactly what am I writing about, here? Well, I'm referring to preparations that Arboretum personnel will be making for the anticipated construction of the Education Center. Anyone who has seen plans for the Education Center (to be located in the West Arboretum), as well as the new parking lot and other small accessory buildings, can easily recognize the scope of the project and the impact it will have on the nature of current Arboretum plantings. Looking at the West Arboretum from a "helicopter view," the construction of the new Education Center will affect somewhere between 60-80% of that area, meaning that all plants currently occupying this area will either have to be destroyed or salvaged. One of my tasks, as the new Collections Manager at the Arboretum, is to make recommendations on which plants can be saved (where feasible) and which ones should be removed. Below, I will talk about some of the criteria that are being used to make these tough decisions. First of all, remember that the Arboretum's mission includes finding, evaluating, releasing, and promoting plants that are adaptable to North Carolina landscapes. Once these plants are established in the horticultural trade, removal of the plant in the Arboretum allows us to bring in newer plants. After all, on only 8 acres, the Arboretum cannot grow full-sized specimens of all of the 5,000+ plants currently contained here. As such, process of identifying which plants should be kept for our collection from the West Arboretum has already been undertaken. Originally, this was started two years ago, under the able abilities of (then) Arboretum Curator Doug Ruhren and Arboretum Research Technician Mitzi Hole. Working diligently, they produced a list of plants that will be impacted by the construction of the Education Center that is 85 pages long! I am now working with that list. The priorities we are establishing to salvage plants from the West Arboretum are based on two major criteria: 1) the size of the plant and 2) the rarity of the plant in cultivation. If the plant is too big for us to salvage, based on our ability to dig it out with a tree spade, and we deem that it is a plant that we would like to "keep," we will propagate it as a future a replacement plant. If the plant is small enough to dig with a tree spade or by hand, we will move it to a new location elsewhere in the Arboretum to keep it safe from "bulldozer-blight." However, propagating, digging, moving, and removing hundreds of trees and shrubs takes a lot of time. Expect to see activity starting as early as this summer. As an example, consider the following. Acer buergianum 'Maruba Tokaede', a rare cultivar of trident maple, is located in bed W33 in the West Arboretum. (This bed is very close to the "gravel pad," and will be completely lost when construction starts.) Since the plant is rare, we would like to save it. However, the specimen is in poor condition (with a damaged trunk), and it is also too large for our tree spade to dig. As such, this plant is recommended for removal, but we would like to propagate it beforehand. On another larger-scale example, the entire redbud (Cercis) collection will need to be removed to make way for the construction crews. Since this collection is of utmost importance to the Arboretum, especially as a focused breeding program is initiated, extraordinary efforts will be taken to preserve the plants. However, redbuds are not among the easiest of small trees to transplant. A transplant-stressed redbud is much more likely to be affected by Verticillium wilt, a serious problem, and we could, realistically, lose some of the trees because of this disease, even after they are transplanted out of harm's way. The JC Raulston Arboretum would like to extend a very special thank you to Pi Alpha Xi (PAX), the Ornamental Horticulture and Floriculture Honor Society, for their support of projects at the Arboretum. We are very pleased to announce that PAX has recently agreed to help fund our new engraved plant label project with an allocation of $2,000. This grant will be used to purchase the materials that the Engraving Volunteers will use in engraving more new signs for the Arboretum plants. Thank you, PAX for your continued support of the Arboretum! Rest assured, special plants in the collection such as the 'Fantasy' crepe myrtle (Lagerstroemia fauriei 'Fantasy') and Momi fir (Abies firma), have already been identified and will NOT fall within the construction zone. We ask that all Friends and other visitors to the Arboretum keep an open mind as we embark on realizing a long-held goal of the Arboretum - that is, to see the Education Center built. These are indeed exciting and busy times for the Arboretum and we're delighted that you will share them with us! This year at the JC Raulston Arboretum look for 'new signs' of activity, as the newest group of volunteers, The Engravers, begins a long-term project of making engraved plant labels. Since late fall, this group has been working hard, learning about the operation and many capabilities of the Arboretum's multipurpose New Hermes Engraver, and developing a format for the labels. An example, shown at actual size, of our new engraved labels. The computer savvy volunteers that have made this project happen include, Bill Atkinson, Virg Birkin, Teresa Cyr, Judy Elson, Ann Lurie, Ann Myhre, Bob Roth, and Walt Thompson. The Arboretum's Plant Collections Management Fellow, Todd Lasseigne, checks the botanical nomenclature before each label is finalized. Chris Glenn and Valerie Tyson have been invaluable for their continued help and guidance with the engraver's computer system. Many different types, styles, and colors of labels have been made and evaluated at the Arboretum for their readability and overall appearance during the past several months. A standard label format that is suitable to use throughout the Arboretum has now been finalized. A special thank you to all of the people and Arboretum cats who took a moment to share their opinion with one of the Engraving Volunteers. The Finley Rose Garden will be the first area of the Arboretum to receive new plant labels. Throughout most areas, each new plant label will contain the same basic information about each plant, including the scientific name, common name, family, and world origin. The chosen label color is a rich, dark brown with a matte finish designed to reduce glare and reflection. The most commonly used label size will be 3-inches by 5-inches, although larger or smaller sizes will be used for special plants. The label we will use is a UV-stable, modified acrylic material that is able to withstand the elements of the four seasons. The staking system that will support each engraved label is composed of an angled plate attached to a galvanized metal wire. The stakes are available in several different heights. The engraved label will be attached to the plate of each stake using a 3M Dual Lock"! "Velcro-like" industrial fastener. Each label will be slightly angled to increase its ease of readability. In some of the more challenging areas of the Arboretum, other types of staking systems are being investigated, including the use of a transparent acrylic stake. Finally, photographers please don't worry! We will certainly be keeping your future photos in mind as we place the labels in the Arboretum. We do not plan on fastening any labels in a permanent manner that could potentially interfere with a photograph of a plant. This is a very important long-term project at the Arboretum, and more volunteers are needed and invited to join the Engraving Group. If you are interested in helping, please contact the JCRA Volunteer Coordinator, Nancy Margaret Brodd at (919) 515-3132. Nature has a way of moving out old energy to make way for the new. The Labyrinth Garden has survived hurricanes, floods, and droughts, but not the winter snow storm that dumped 20 inches of snow on the garden. While the low plants along the path were less affected, the 69 majestic, 25 foot tall, Lelyand cypress trees were severely damaged by the weight of the snow. Sadly, there was no way to save them, and they were removed. The Labyrinth Garden now has a very different feel: exposed, less protected, open, free, and sunny. The experience of being in a protected, secret garden is not there. There are no longer deeply rooted plants growing in the garden. Those coming to the garden describe feeling shocked, sad, and angry. This is part of grieving the loss of the Leyland cypress trees. We hope that those of you who walk the remaining stone path will take its healing energy with you out into the community. Those of us caring for the Labyrinth Garden work with nature and the recycling of energy. We see this as nature's way of letting us know that the garden will soon be closing to make room for the new Education Center. 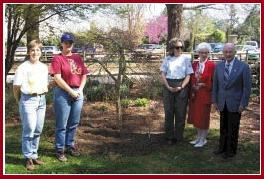 On March 15, 2000, a small group gathered in the Southall Garden to dedicate the new Japanese maples donated by Dr. and Mrs. Fred Cochran. In all, six Japanese maples were given to the Arboretum with one destined for the live auction at this year's Gala. It all began a few months earlier with a phone call from Dr. Roy Larson. 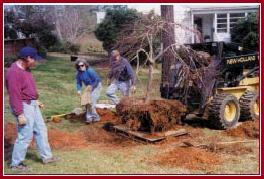 Dr. Larson mentioned to Bob Lyons that Dr. and Mrs. Cochran were moving from their home leaving behind numerous Japanese maples. These maples were considered by Dr. Cochran to be some of his best work at breeding Japanese maples. Dr. Larson suggested that the Arboretum should ask the Cochrans to consider donating them to the Arboretum, which they were quite happy to do. Early in the spring, Mitzi Hole arranged for Anne Calta, Diane Cutler, Bradley Holland, and Paul Lineberger to meet at the Cochrans with machinery to dig the maples. The effort was back breaking; however, it was a total success since all Japanese maples survived the process beautifully. The Japanese maples can be found in the Japanese Garden, Southall Garden, and near the crape myrtle collection. Dr. Cochran is a retired professor in the Department of Horticultural Science where he served as Department Head from 1956 through 1967. His years in the department saw many achievements, including several teaching awards and many plant releases. In 1968 he was elected to the NCSU Academy of Outstanding Teachers in addition to receiving the L.M. Ware Distinguished Teaching Award, Southern Region, ASHS. Six years later he won the national L.M. Ware Award. Along with his breeding research in horticultural crops, he also introduced several ornamentals such as 'Sunglow', 'Wolfpack Red', and 'Pink Cloud' azaleas. Did you miss the event of the year? 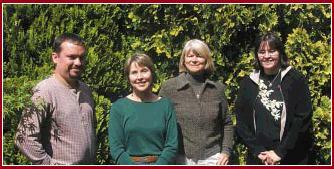 The 2000 Gala in the Garden steering committee began work last November. With a short break to celebrate the holidays in December, they hit the road running in January. Under the capable leadership of Karen Subermann, this dynamic, hard working group of faithful JCRA supporters has proved to be old hands at running an event. The committee chairs called on friends and business acquaintances to provide support for the Gala. Many local corporations were contacted to provide corporate support while smaller concerns and friends contributed several varied items for the silent and live auctions. The response was wonderful and at this writing the corporate donations top $40,000. This year's Gala, held on May 7, 2000, was entitled "A Parade of Hats," and was held in a new and exciting format. The first tier, Garden Spirits Cocktails, held from 3:00 until 6:00 p.m., for a cost of $50, included a silent auction with an amazing array of items. At a cost of $125, the second tier, Secret Garden Dining, included the Garden Spirits Cocktails and silent auction AND was followed at 6:00 p.m. by fine dining and a live auction. The choicest of auction items were saved for the live auction where the bidding, led by Rufus Edmisten's auctioneering skills, was fast and furious. Now the decorations are down, the auction items have gone home with the lucky highest bidders and the committee is taking a well earned rest. A more detailed report will be in your next newsletter. See Bob Lyons' letter (page 1) for the big announcement. The 300 foot ramp leading to the Roof Terrace Garden will be flanked by a glorious border created by the designers of the Arboretum's existing Perennial Border. As a part of the Horticultural Field Laboratory (HFL), the Arboretum is supported by HFL staff and services. Tucked away in a non-public area, this facility is essential as it also contains JCRA offices and safe and secure facilities for thousands of dollars of computer equipment (currently, a mini-campaign for this project is underway by our Arboretum volunteers). Every aspect of Arboretum horticulture will pass through these doors since it has quality space for the superintendent of the Horticulture Field Lab. All driving visitors will first see this lovely feature of the Education Center. The entire Roof Terrace exhibits shallowbed gardening techniques important for urban gardens. The donor naming this area will be recognized prominently in high-traffic areas approaching the Terrace. Overshadowing the South Terrace, this Arbor provides a gracious transition from the Education Center into the JCRA. This will be a circle separate from the Parking Area, landscaped with planters and benches. Computer Stations at the Reception Desk and in the Entrance Pavilion will allow visitors to access the plant inventory and maps to enhance learning experiences at the Arboretum. A "quiltwork" of wood veneers from trees around the world will make the Reception Desk a very special feature. Donors of $5,000 and more will be recognized on a plaque on permanent display in the Education Center. Names of all contributors of $500 or more will be placed in a ledger of donors in the Center. For a contribution of $250, one of the folding chairs used in the auditorium and classrooms will bear the name of your choice. You or your honoree will also receive a certificate. These locally engraved bricks are a great way to commemorate an occasion, honor a friend, or remember a loved one. You or your honoree will also receive a certificate. Wonderful memories have been made recently by the JCRA volunteers. Thanks to the thoughfulness and organizing skills of volunteers Charlotte Presely, Suzanne Edney, and Mary Edith Alexander, the volunteers hosted a surprise luncheon party for Catherine Maxwell on March 15, 2000. Catherine Maxwell is the former Director of Development for JCRA and is now Director of Associate Relations at egarden.com <www.egarden.com>. These ladies rolled out the red carpet, literally, and transformed the Arboretum classroom into a colorful, exotic retreat full of Bohemian streamers, green grass carpet, and a decorative sun that filled an entire corner of the room. Catherine received several gifts from the volunteers which included a ceramic vase, signature dragonfly pins from Edith Eddleman, and an incredible bowl with pressed leaves and flowers, made by the talented Mary Edith. After many words of praise, both to and from Catherine, we all sat outside in the Southall Garden enjoying the beautiful day and eating the delicious foods prepared by those attending (see page 16 for a recipe). Everyone left with great memories, new and old, thanks to Catherine Maxwell. The 3rd Annual Volunteer Appreciation Luncheon was held April 11, 2000 at the NC State University Club. All the snow in January appropriately forced this event into April during National Volunteer Week. Everyone enjoyed the warmer weather and gathering outside in the garden area prior to the luncheon. Some impressive facts were delivered during the luncheon, making it both amazing and humbling to know how much the JCRA Volunteers contribute. The total number of volunteer hours in 1999 equaled 6,705 hours. That's 3 fulltime positions or 6 years of my part-time position! The four categories of volunteering with the most hours in 1999 were Curators with 1,591 hours, Gardeners with 1,296 hours, Labelers and Mappers with 993 hours, and Tour Guides with 747 hours. Total number of visitors who signed the Visitor Center book equaled 5,579. Please refer to our Fall 1999/Winter 1999-2000 newsletter for individuals with Top Volunteer Hours in 1999. Everyone enjoyed the raffle, of course! The generosity of the following contributors allowed us this fun: Homewood Nursery, Inc., Fairview Greenhouse & Garden Center, Atlantic Avenue Lawn & Garden Center, Horticopia, JCRA Volunteer and recipient of the 2000 American Garden Writers of America Quill and Trowel Award, Bobby Ward, our own Director Bob Lyons, JCRA Research Technician, Mitzi Hole, JCRA Development Associate Donna Walker, NCSU Horticulture professor, Dr. DeHertogh, and his wife, Mary Belle, and JCRA Paradise Garden Curator, Frankie Fanelli. Thank you all! During the luncheon, Amelia Lane, Mixed Shrub Border Curator, announced the idea of a week long tour of the Volunteers' own private gardens. This generated a lot of positive response and was thus held during the week of April 24, 2000. Maybe we should put this on our calendars for next year! The luncheon ended with Bob Lyons sharing information on our Education Center Complex. Please welcome Nancy Simonsen as the new Wedding Co-coordinator. She will be working with Frankie Fanelli, who will be leaving in the fall. Nancy has been volunteering at the JCRA since August 1998. She currently volunteers with Frankie in the Paradise Garden and volunteers in mailings, plant distribution, and special projects. Some of the NCSU Horticulture Club students are now Volunteer Tour Guides for Children's Tours. Training was held Sunday, March 27, 2000. Guy Meilleur, Tour Guide, led the students on an informative and enjoyable sample Children's Tour of the JCRA. Special thanks to Mary and Claude Caldwell, Carolyn Fagan, Vivian Finkelstein, Fran Johnson, and Harley Mudge for their contributions for this and the Tour Guides 2000 training, held March 12, 2000. The World Botanic Gardens Congress 2000 pre-conference tour, "Premier Gardens & Arboreta of the Piedmont" (June 21-25), will be preceding their annual conference in Asheville, NC. The JCRA is one among many gardens chosen, so our guests will be on a tight schedule. We will be hosting up to 50 international guests from 8:30 a.m. to 12:30 p.m., with lunch included. We are looking for about five volunteers to help greet and direct our guests, sell apparel, and serve boxed lunches. Lunch will be provided for all. Encore is a course offered by NCSU to people in retirement. Anita Kuehne, who gardened part-time at the JCRA in 1999 is now the Program Coordinator of Encore. She wishes to hold the fall class at the JCRA. This is a six-week course, held every Thursday at 1:15 p.m. to 2:45 p.m. She hopes to have an introductory tour for the first class and have Curators teach the remaining. If you are interested in volunteering for this, please contact Anita Kuehne at (919) 515-5782 or <anita_kuehne@ncsu.edu>. This is a one day symposium with several speakers, book signings, apparel sales, and a lunch. It will be held at the Sheraton Imperial Hotel in Research Triangle Park, NC. Horticulture Magazine hosts this function in various cities across the US, about four times a year, and has chosen Raleigh and the JCRA to help host this fall. For the event itself, we will need about six volunteers to help attendees register and for selling apparel and memberships. For that weekend, we hope to have some JCRA Tour Guides available at the Arboretum for visitors drawn to the area by the symposium. To volunteer for these upcoming events, please contact Nancy Margaret Brodd at (919) 515-3132 or <nancy_margaret@ncsu.edu>. The following are volunteer positions that need to be filled as soon as possible. Volunteer Interest Forms are available in room 162, Kilgore Hall and the Volunteer Office for new volunteers. If you are interested or have any questions, please contact Nancy Margaret Brodd at (919) 515-3132 or <nancy_margaret@ncsu.edu>. Garden of Winter Delights Co-curator - This person would be curating with Doris Huneycutt, who curates every other Wednesday. This position requires extensive plant knowledge and regular hours (three to four hours per visit) every other week (preferably Wednesday). Guidelines are provided. Office Assistant - Donna Walker, Development Associate, is looking for someone to help in our campus office for a couple of hours a week. Some data entry skills are needed. Free parking! Plant Name Verification - Our database needs updating. These volunteers will be verifying the common names, world origins, and other plant information. This may be done at home using our reference books. There will be periodic meetings with Todd Lasseigne and/or Valerie Tyson. Weekend Waterers - It's getting that time of year again when we need help watering plants on the weekends. This should take four to six hours per weekend depending on the weather. West Arboretum Plant Recorder - We need one volunteer from beginning to end for this project. You will be working independently, after initial training with Todd Lasseigne. No fore plant knowledge is necessary. You will be responsible for reading a fine gauge instrument to record plant growth in the West Arboretum. This project will end with the construction of the Education Center. Engravers - These individuals need to be computer savvy and willing to learn how to use the engraver machine. Initial training by Nancy Doubrava is a must. Afterwards, engraving can be done independently. Plant Records Data Entry - We need help entering new accessions and planting or death reports into our plant records database. This needs to be done at the JCRA (easy parking). Knowledge of FileMaker is helpful. Tour Guide Coordinator - HELP! Yes, Fran Johnson is leaving after many years. We will miss her dearly. More details in the next newsletter. We're still working out some of the details, but thought you might want to plan ahead and save some dates. "Horticultural Photography.....Exposed: A Lecture Series and Workshop"
The workshop will be conducted by Bob Lyons, JCRA Director. Also a professional photographer, he has shown his work nationally, published over 200 photographs, is a principal photographer for Horticopia CD-ROMs, and has received awards from the Garden Writers Association of America, among others. Part I. September 22 (Friday evening): Two hour lecture with refreshments. This is open to as many people who would like to enroll. There will be a fee with a discount for JCRA members. Part II. September 23 (Saturday morning): One hour lecture. Instructor-assisted shooting at JCRA (2 hours). Lunch on-site & provided (1.5 hours). Instructor-assisted shooting (3 hours). Two rolls of film and processing are included in the cost of this workshop. This workshop is limited to 15 people and costs $60.00 for members and $90.00 (JCRA membership included) for non-members. Part III. September 30 (Saturday late morning): Individual review of personal images, anonymous critique of best shots of class by the class, and selection of single shot for publication in JCRA Newsletter by class consensus. Wrap-up and conclusion. This workshop is limited to the people who registered for Part II. Interested? Send an e-mail to or call Chris Glenn at <chris_glenn@ncsu.edu> or (919) 515-5361 and we'll let you know when the details are complete. Your initial interest will not commit you to registration later. This was one of many of the scrumptious dishes served at Catherine Maxwell's Surprise Lucheon. Heat oven to 400F. Grease 9" square pan. Mix crabmeat, cheeses, and peas and place in pan. Beat remaining ingredients until smooth. Pour on top of other mixture. Bake 35-40 minutes or until knife inserted comes out clean. Cool 5 minutes. Makes 6-8 servings. Friends of the Arboretum lectures are free to those with current membership. There is a $5.00 fee for non-members. Please bring your membership card. We will have a current membership list at the door. Memberships will be available for purchase at the door. Entrance is free to all NC State students with ID and Department of Horticultural Science faculty and staff. All lectures are in room 159, Kilgore Hall on the NC State University campus and begin at 7:30 p.m. There is plenty of free parking at the intersection of Hillsborough and Brooks. Please call (919) 515-3132 if you need directions or information about any of the following events. "The Importance of Echinacea Conservation in North Carolina"
Details will be posted to the Web site as soon as they are available. Everyone enjoyed the 3rd Annual Volunteer Appreciation Luncheon. Photograph by Bob Lyons The roses in the Finley Rose Garden were labeled. Photograph by Christopher Todd Glenn Hundreds of new perennials were planted in the Perennial Border.